BEIJING, Sept. 1,Chinese Premier Li Keqiang on Saturday met with Burkina Faso's President Roch Marc Christian Kabore ahead of the 2018 Beijing Summit of the Forum on China-Africa Cooperation. 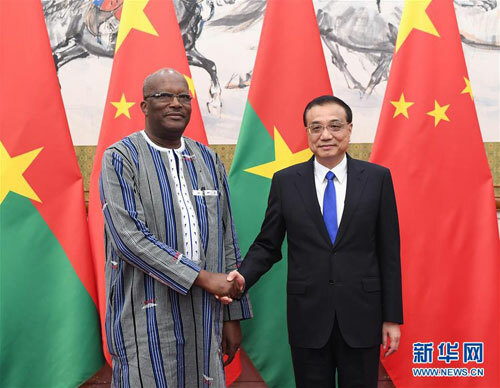 China will promote bilateral cooperation with a focus on agriculture, medical care and health, human resources, and energy that touch upon development and people's livelihoods, said Li, encouraging competitive Chinese enterprises to invest in Burkina Faso. Kabore called upon the two countries to enhance cooperation in various fields including personnel training, health, agriculture and energy and achieve mutual benefits.